Two coach houses and at least two garages were damaged by fire Sunday afternoon along an alley between the 1500 blocks of Wellington and Nelson in nearby Lakeview. Investigators have yet to announce an official cause of the fire, but several neighbors reported that fireworks were set off in the alley shortly before the blaze was reported. No one was injured, however at least 3 people have been displaced. The fire left about 90 nearby residents without electrical power Sunday afternoon. 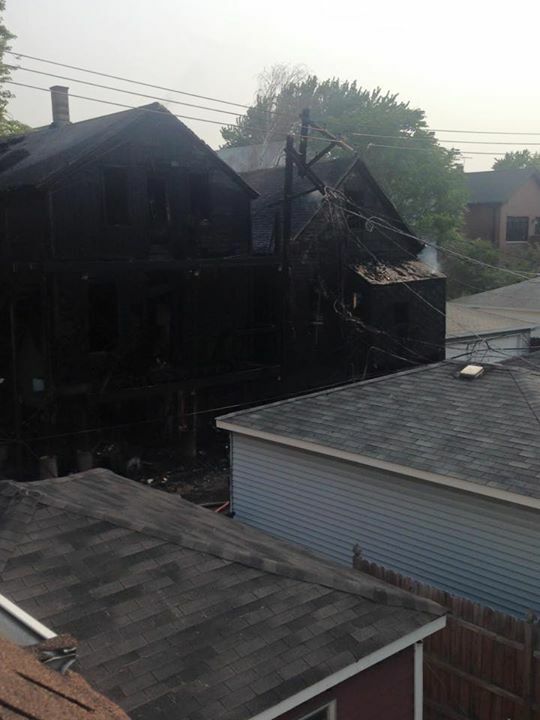 A suspicious fire broke out around 3:10AM Saturday in the 3200 block of Sheffield. The rubbish fire did not spread to any structures, police said. On June 22, surveillance video caught two men apparently setting a trash can ablaze in an alley one block south of Saturday’s fire. Two coach houses sustained significant damage. Earlier in June, an overnight fire consumed the rear porch at the old Leona’s restaurant about five doors down from Saturday’s incident. • Over in Lincoln Park, a dumpster fire in the 900 block of Montana at 8:15PM on June 27 was classified as arson. Another dumpster fire was reported in the same alley on May 18.